By the time humans make it to the Red Planet, navigating the topography like native Martians should be an easy feat, thanks to the months-long efforts of Finnish filmmaker Jan Fröjdman who created this 3D video flyover of Mars. According to Gizmodo, the film is the result of Fröjdman piecing together 50,000 hi-resolution still shots snapped by NASA’s HiRISE camera on the Mars Reconnaissance Orbiter over the past 12 years. The photos require 3D glasses in order to fully observe details of the planet’s surface, but this breathtaking film offers a glimpse at what lies beneath the dust found in Mars’ atmosphere without the need for specialized spectacles. The process of converting the photos into film took three months. Fröjdman began by colorizing the photos, which were originally captured in grayscale. He then identified the craters, mountains and canyons in each of the stereograms and arranged them in matching pairs. In the final step of what he referred to as a “very slow process,” Fröjdman used his reference points to connect the images before rendering them out in video frames. 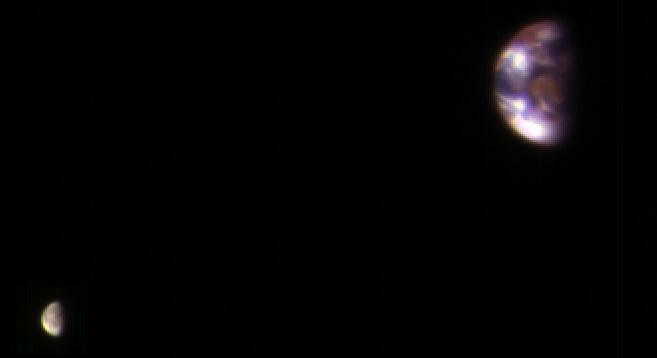 Just to get in you in the habit of seeing things from a Martian perspective, the HiRise recently offered us a snapshot of how Earth and the moon look from Mars that was impressive but rather blurry. Absolutely divine. BRB, we’re off to dream up a design of what our house will look like on Mars.